IDEA 6.5 and integrate its important functionality into other views. To understand the requirements better, we'd like to request community feedback. do you consider essential, and which are not? in IntelliJ IDEA are also welcome in this thread. What I miss in VCS (CVS in my case) integration is the ability to review incoming changes. In this regard a Changes view like interface for the changes either just retrieved (Update Project) or changes that are still pending on the server (Check Project Status) would be a big help. Group the changes by username and check-in comment below that. This is especially useful for senior developers in a team who may want to review changes committed by less experienced developers. Additionally, I would suggest an additional view to easily review such changes. What I'm envisioning is a screen with a 4 level tree at the left consisting of the levels username, change comment, filename, method. At the right would be a split pane (my preference would be a horizontal split) showing both the old and the new versions of the code with the changes highlighted. I feel that such an interface would greatly aid in quickly reviewing changes. And once such a view is built, I'd suggest to also apply it to the outgoing changes view, as reviewing your own changes is often a good idea. We do plan to provide such interface as well. MH> want to review changes committed by less experienced developers. MH> consisting of the levels username, change comment, filename, method. MH> code with the changes highlighted. It's been some time since I last used CVS, but I remember my main use for the File View is now covered by the Changes view: to find out what files have been modified, deleted, added, etc. the ability to review incoming changes. That's just what TMate provided, and exactly what I wanted to see integrated into IDEA proper. be optimal for performing code review. Again, IDEATMate made me happy here. I could easily browse the files affected in each changeset, spot the modified portions, and revert any bad/uneeded changes. IDEATmate = VCS bliss. I've used the File View pretty much, but not anymore since the sweet changelists are there. What i miss is a configuration for switch on/off modules (cvs-roots). A secound feature would be an automatic file history on the bottom of the File-View if a single file is selected. I use CVS as my version control software. I like being able to issue a commit against a directory and then being able to exclude certain files from actually being commited by unchecking them in the dialog. I also like being able to right click on a file name to bring up a diff window showing the changes since the last commit. One feature that would be VERY helpful is if I could have athe ability to enter commit comments before I close the diff window. I use the diff functionality to remember what changes were made to a file so I can enter a meaningful message when I commit it. The problem I have is that if I have made several changes, I have to take notes on what I want to put in the checkin message so I don't forget what I want to say before I get a chance to enter the message. If I could craft the check in message as I am looking at the diff's the whole check in process would be a lot smoother and faster, at least for me. the bottom of the diff window containing the comment? files from actually being commited by unchecking them in the dialog. process would be a lot smoother and faster, at least for me. RS> bring up a diff window showing the changes since the last commit. RS> faster, at least for me. Could you please file a JIRA request for this feature? The only thing I've used the File view for is to confirm what branch (ie sticky tags) my check-in is going to end up in. I'd much rather see this integrated into the changes view. integrated into the changes view. Yes! I have found myself on occasion using an external CVS client just for this feature. Believe me, there's nothing worse than accidentally checking some code into the wrong branch. Even though it's out of scope for 6.5, I would love to see the sticky tag on the normal commit dialog too for the same reason. I dislike how the current version history window displays branches (CVS client). Standalone CVS clients (eg CrossVC on Linux or WinCVS on Windows) seem to do a better job and also offer a graphical view. 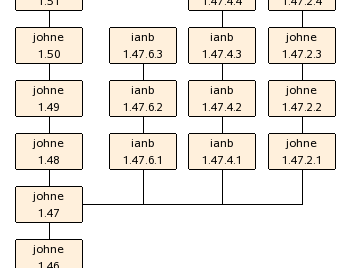 There only appears to be one level of indentation in the version column of the history window and so if two or more branches are rooted at the same point, all branch histories are shown together eg there are three branches rooted at version 1.47 shown below. I find this hard to read. >> see this integrated into the changes view. IB> normal commit dialog too for the same reason. RG> http://www.jetbrains.net/jira/browse/IDEA-5848 and simliar requests? The only thing I've used File View for checking what branch my check-ins are going. I'd much rather see this in the changes dialog. The most common case is that all changes are going to the same branch, so having an extra column in the dialog would be a lot of clutter. However, if some are going to an unexpected branch, I'd really like to see that before checking in. Perhaps each change set could be divided into chunks, one for each unique branch it's going into. those thousands of unversioned files. many stand-alone CVS GUI clients do (Graph view in WinCVS for example). resource it takes. Changes view is aways there, always eating memory. In conclusion, I still find File View useful. its current features do you consider essential, and which are not? information in IntelliJ IDEA are also welcome in this thread. 1500 unversioned files. Pop-up menu on this group takes ages. tell IDEA skip those thousands of unversioned files. First of all - thanls for a detailed reply! GT> would then tell IDEA skip those thousands of unversioned files. everywhere through the color of file and class names. We'lll see what we can do about this. of the File view in the Changes view. when the view isn't open, and we'll try to do so in the next version. GT> In conclusion, I still find File View useful. >> important functionality into other views. >> of its current features do you consider essential, and which are not? >> information in IntelliJ IDEA are also welcome in this thread. I am happy that you find my comment somehow useful! good to hear that it is planned. project is not of any use for a decent-sized project? ability to filter out files which are not under version control. far is it from adding the ability to filter the other VCS-types? see it is there already. is displayed everywhere through the color of file and class names. for root directories again dependent on VCS status. features of the File view in the Changes view. Cannot disagree to this point of view. the difference is really noticeable. GT> GT> In conclusion, I still find File View useful. >>> important functionality into other views. >>> of its current features do you consider essential, and which are not? >>> information in IntelliJ IDEA are also welcome in this thread.